Trinket boxes have been around a long time as tokens of affection and as the ever present catchall for rings,earrings, and the like. We present here a nice selection from two companies that produce a high quality item. For the bird lover and equestrians we recommend Ayshford China. If you like William Morris designs, you should take a look at the Museum Collections. We also carry Halcyon Days, Staffordshire, Moorcroft and English Enamels, please select the Enamel Box section on the left. 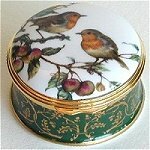 A nice selection of silver plated trinket boxes can be found in the Silver Scenes Boxes section. These come complete with whimsical verses that surround the outside of the box.